Hillary Clinton condemns "apparent terrorist attacks" in N.Y., N.J., Minn. In Minnesota, eight people were taken to the hospital with injuries after a man went on a stabbing spree in a St. Cloud, Minn., mall Saturday evening. 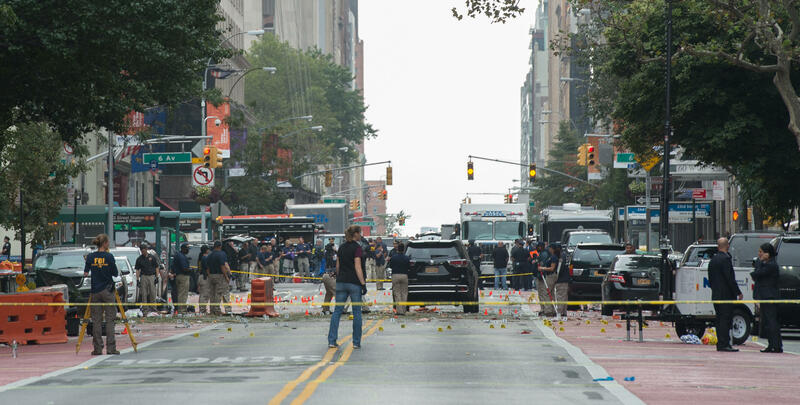 The same night, a bomb went off in New York City’s Chelsea neighborhood, injuring dozens; a separate pipe bomb injured dozens more when it went off near a charity 5K race on the Jersey Shore Saturday. No fatalities have been reported in any of the attacks. Clinton’s statement came after ISIS claimed responsibility for the Minnesota mall attack, with the ISIS-run Rasd news agency calling the suspect a “soldier of the Islamic State.” A federal law enforcement source told CBS News the Minnesota suspect went through the mall asking people if they were Muslim, stabbing them if they were not. The Democratic candidate also noted that she has “laid out a comprehensive plan” to stop similar “lone-wolf” attacks in the U.S. I would like to express my warmest regards, best wishes and condolences to all of the families and victims of the horrible bombing in NYC. On Saturday night, Trump told a rally in Colorado Springs that “a bomb went off in New York” before he or anyone else, including the New York Police Department, had publicly confirmed that the blast came from a bomb.